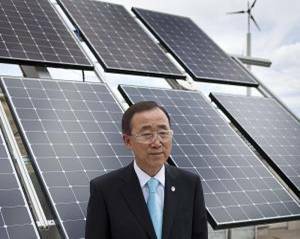 Having first visited the United Nations 20 years ago, it seemed like a monumental task to turn this large bureaucracy into a force to accelerate the interconnection of renewable energy resources between all nations. The Cold War had just ended, and the UN Intergovernmental Panel on Climate Change (IPCC) did not yet exist. The one official that got the significance of this work two decades ago was Assistant Secretary Gen. Robert Muller (now deceased), who stated, “I will not repeat it often enough. We need several great world engineering projects which will help save us incredible sums of money spent on national duplications, increase productivity of the world economy and help us save the environment... The world energy grid should receive top attention and be supported.” We were honored with his endorsement and foresight to create international cooperation on clean energy. p.s. Please call or email so we can arrange for you to get a tour! In this new immersive visualization environment we see opportunities to accelerate sustainable development on many levels.